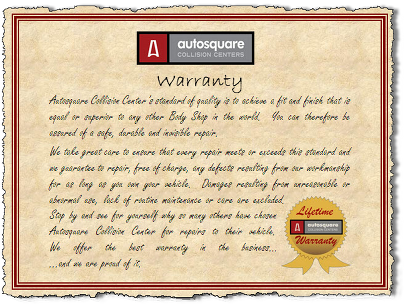 Autosquare Collision Center’s goal is to ensure the repairs we make to your vehicle meet a standard of fit and finish that is equal or superior to any other Body Shop in the world. You can therefore be assured of a safe, durable and invisible repair. We take great care to ensure that every repair meets or exceeds this standard and we guarantee that our work will be free of defects resulting from our workmanship for as long as you own your vehicle. Damages resulting from unreasonable or abnormal use, lack of routine maintenance or care are excluded. Stop by and see for yourself why so many others have chosen Autosquare Collision Center for repairs to their vehicle and check out our Before & After pictures. …and we are proud of it.